A confirmation of delivery will be sent via e-mail or text message if a mobile number has been provided with a tracking number to track parcel whilst in transit. Please make sure there is someone at the address given to accept and sign for parcel. If you opt for the parcel to be left in a safe place with No Signature Required You are Accepting Liability for your order so we will Not be responsible for any replacement items unless Faulty. Delivery Times 3 – 5 Working Days Excluding Weekends and Bank Holidays although we aim to get our orders out as quickly as possible. Once orders have been completed you will receive an email to let you know the order has been completed and ready for dispatch. Ireland, Isle of Wight, Channel Islands Please Contact Us for Delivery Prices as the prices on the website are for UK Mainland Only so your order will not be dispatched until extra postage costs are paid. For all other locations please contact before buying products. We use DHL delivery service . with a ‘predict ‘ timed delivery option. Please allow 48 hrs for orders to be processed prior to being dispatched. Unless prior arrangements have been made. Please supply full name and address with a contact number for the courier . Returns If you request a Credit on an item we have supplied correctly to you, but it is surplus to your requirements, we will authorise a credit subject to a 10% handling charge. If the item sent to you is faulty, a replacement will be sent out . Refunds are calculated on the Nett cost price of the item and we will not refund any shipping costs incurred during this process. Goods must be returned in original unopened packaging including any documents contained within and a Credit will be paid once goods are received and inspected. If you return an item and wish for it to be replaced with another item you will have to pay for the delivery cost to us, then you will be CHARGED for delivery back to you. 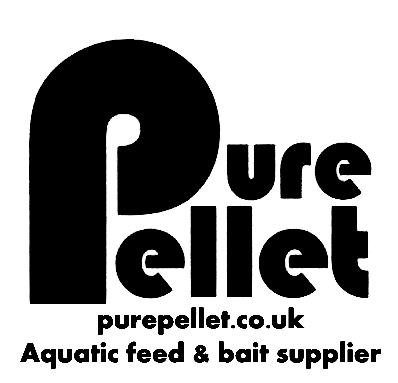 Pure Pellet are based in Oxfordshire near Linear Fisheries and sell Aquatic feeds to the entire UK.